For years law firms have dutifully scanned medical records and other special damages proofs, striving for the ideal of the paperless office. Unfortunately, just scanning the medical records for all of your personal injury clients does not mean that those scanned documents will make things any easier for your staff, or bring you any closer to having a paperless office. 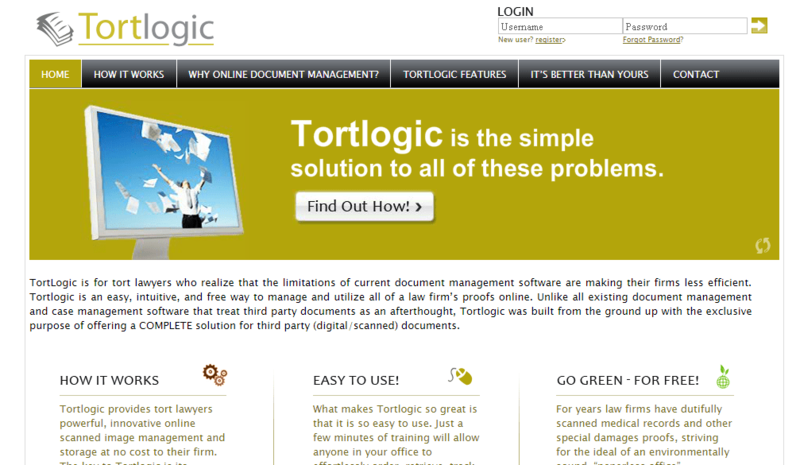 Tortlogic.com provides tort lawyer’s powerful, innovative online scanned document management and storage at no cost to their firm. Tortlogic.com was designed exclusively for personal injury lawyers, .Net 2.0 and SQL server 2005 was used to build this website. It provides the highest quality retrieval for medical bills, medical records and lost wages proofs nationwide. The format is easy to use and allows the legal professional to drill down to a particular client, a particular provider, and view records as they come in. Progress notes for each provider allow the legal professional to track the progress of the request. The legal professional can send notes to Tortlogic, which will also be posted to the notes for that Provider. The key to Tortlogic is its intuitive, easy to use interface. With a little training, every staff member will immediately have access to a powerful tool that will assist with special damages proofs retrieval. With a glance, they will be able to tell exactly what documents are in, what documents are expected and what documents need to be requested. Tortlogic finally delivers upon the promise of digitized special damages proofs. All of your staff can immediately see on one snapshot page of what providers your client has seen, which of those providers have provided medical records and/or billing and what retrieval efforts have been made toward those records that have not yet been received — all on one page! Cutting edge restaurant scheduling software goes live!